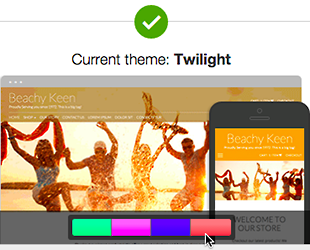 Once you set your theme for the Online Store, you also can customize the colors it uses. 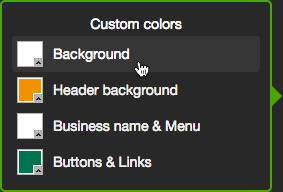 Click the Theme tab and below your Current theme click Customize. 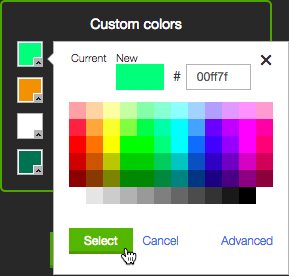 Within each choice, if you want more color choices, click Advanced to pick a color using the spectrum bar or the RGB or HSV value fields. 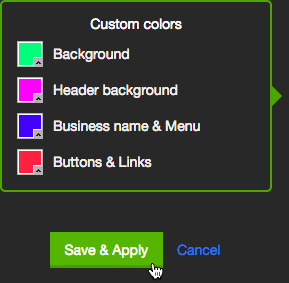 After picking a color, click Select. As you choose colors, the preview automatically updates the entire site so you can see how your colors look together on all of your pages. Once you're satisfied, click Save & Apply. Note: External links are disabled in Preview. Preview also will not display individual page settings if they are left blank. For example, Announcements and Message fields must be filled in for them to appear in Preview — even if you customize the Main message background color. The Style Designer closes and the Theme tab reappears where your current theme displays a color bar with your custom colors. 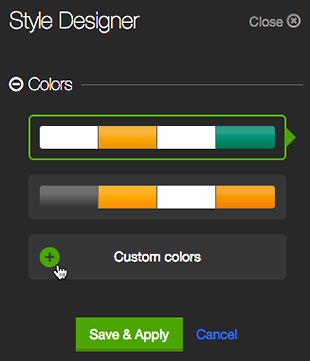 When you're satisfied with your choice, click Save & Apply at the bottom of the Style Designer panel. 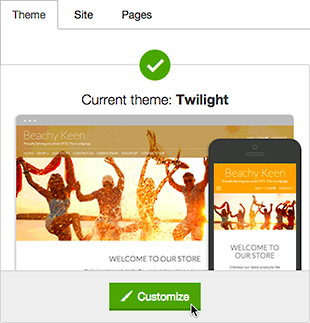 For more on Online Store themes, see Customize Theme Fonts.